ON VIDEO in a Downloadable Version!!! 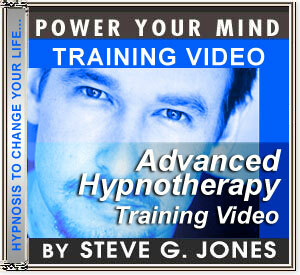 Dr. Steve G. Jones charges $1,700 for the 12-week Certified Clinical Hypnosis course at his hypnotherapy school, the world-famous Steve G. Jones School of Clinical Hypnotherapy, but now he shares his techniques in this effective Hypnotherapy Training Video in DVD or Download format. Several years ago I hired a production crew to create a video where I teach advanced techniques of hypnotherapy.